Manganese is necessary for normal skeletal development and pituitary gland activity as well as as an important activator of some enzymes. Manganese is found in a variety of foods, including tea – which is probably the biggest source of manganese for many people, bread, nuts, cereals green vegetables – such as peas and runner beans. However if your diet does not produce enough, supplements may help. However, older people may be more sensitive to manganese so should take less. 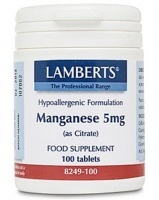 Lamberts Manganese 5mg (as Citrate) - an essential trace mineral health supplement required to manufacture enzymes involved in many body processes. 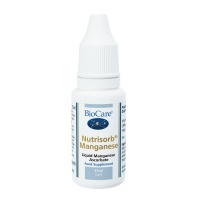 A very high quality manganese mineral health supplement.